If there’s one thing I’ve learned working with and conducting workshops for hundreds of people to help them create meaningful visuals, it’s that people have specific beliefs about visuals. Many of these ideas are not based in experience or evidence (two things which most people I’ve worked with highly value), but rather pervasive myths that take root at an early age and rarely go unchallenged. If I could give any stranger just one gift to help them on their journey, regardless of their interest in visuals, it might very well be this list of myths. I believe they are keeping us stuck in our work, our society, and even our humanity. Myth #1: Visuals are ends, products, things. Reality: Visuals are means, mediums, doorways. When you think of a visual you likely think of a finished product of some kind: an airbrushed photograph in an ad, a video published online, or a painting hanging in a museum. When I think of any of these examples, I not only think of all the creations that preceded them (sketches, proofs, retakes) I also think of the ongoing life they’ve had, the ideas they’ve conveyed, the conversations they’ve started, the legacy they may or may not leave. Visuals are mediums of communication, ways that ideas can be shared and spread. Even when we create them for discreet purposes, they tend to take on a life of their own. We may think the work is simply giving birth to them, but like children, the real work is in setting them on a clear life trajectory that is one of progressive generation. Myth #2: Digital visuals are the best visuals. I expect that when you think of visuals you also mostly think of graphics you see on social media, slides you see at a presentation, photos that have never had a negative, visuals whose lives have been touched or shaped by a computer. These types of visuals certainly have their strengths, especially when it comes to visualizing qualitative data, but they also have their weaknesses. According to a national study conducted by LaPlaca Cohen in 2017, people feel analog visuals are more authentic, less complicated, and allow for better connection to the content. Hand-drawn visuals are still best for outlining ideas at an early stage, a necessary precursor to polished visuals. This also means you don’t need to know how to use computer software to create great visuals! Myth #3: Visuals make anything and everything appear attractive and exciting. Reality: Visuals make us more aware, including of things that might not be desirable. One of my biggest pet peeves is people thinking I’m merely software-competent. While having working knowledge of various design software programs is absolutely an asset, those skills would be worthless if not coupled with skills having to do with the real meaning and purpose of design: creating meaningful experiences for people. Meaning isn’t inherent. Many messages can simply miss the mark and good design processes help to prevent that. Part of the way it prevents this is by exposing realities, including the less desirable aspects of existing or potential projects. You can slap some high-gloss on some yucky substance, it will still be yucky. The better way to create attractive, exciting visuals (and the much harder task) is to figure out how to make the substance, the meat of the thing you are messaging about, truly delicious. Style without substance is vapid, useless, and wasteful. The power of color and splash has often been exploited, used to distract or misdirect. Instead, it should be leveraged to engage, inform, and inspire. Of course, you also can go to the other extreme and make visuals that are too difficult to understand because they are all substance and no style. That’s yucky too. Myth #4: Visuals are simple to produce, much simpler than databases and reports, for example. Reality: Creating complicated, confusing visuals is fairly easy. Creating ones that are simple, that are easier for an audience to understand and therefore better convey messages, takes a lot of time, effort, and focus. In my experience, it can take just as much time and effort, if not more, to put quantitative, written, or verbal communication into visual form. Here’s a decent analogy: while nine months of pregnancy can be taxing, it’s the labor of birth that really pushes a new mother to the edge of her limits. But there’s good news! Just like a woman who’s expecting practices breathing for months, if you start using visuals earlier on in your researching, analyzing, writing, planning, and collaborating processes, you will be better equipped to build on those when it comes time to create ones for sharing with others. Myth #5: Visuals are merely nice-to-have. Most of us agree that visuals are interesting, can be fun, and can at times be breathtaking. We may not realize that they are also absolutely necessary. Without them, important ideas struggle to germinate, take root, and grow. Do you think that’s too bold (or even biased) for me to say? Okay, let’s pretend for a moment that one can’t make a strong enough case by simply acknowledging their many significant benefits (for example, they capture our scarce attention, increase speed and ease of understanding, help us retain information over time, inspire us to make decisions, equip us to act on those decisions, and are easy to share and thereby help us communicate with large numbers of people, just to name a few). Now: consider petroglyphs that served to help indigenous tribes all over the world survive for a millennia, Egyptian and Greek and Roman and Christian art that has defined the ideals and trajectory of western civilization, and the timeless cross-cultural impact of individual artists like DaVinci, Van Gogh, Picasso, Warhol, and Kahlo. That’s just scratching the surface. Most economies would collapse without the persistent power of commercial art (advertising). And none of us can honestly imagine our lives without the work of those designing buildings and their interiors, street signage, clothing, and interfaces for computers and smart phones. Many of us can’t imagine living without the work of those producing books, magazines, TV shows, or films. Visuals help us observe and find all sorts of diseases in our bodies, ancient artifacts underground, weather patterns in our skies, and solar systems beyond our own. Would we understand anything of history or science or culture without these mediums and forms? So: If you have something important to say, visuals are vital. Period. Myth #6: Only artists have the special talent to make visuals. Reality: We all can and do make visuals. Artists simply have more practice. At this point perhaps you’re thinking all these myth busters are about making you more reliant on people like myself, artists and designers, those with “special talents.” I will free you of that notion too. The only gift people like me have is the persistence and dedication to continue to work at our craft so we can get better and better, day by day, visual by visual. You know that proverb “If you can talk you can sing, if you can walk you can dance”? Well I think if you can write, you can draw. It’s essentially the same action: drawing lines that form shapes that mean things to other people. It’s when we think we can’t draw that we stop practicing and remain stuck in our abilities. As I’ve already said, it does take focus, effort and patience, and if you don’t think you have that in you, you should absolutely work with someone who does, instead of throwing in the towel completely (after all, we’ve already established that visuals are enlightening and important). 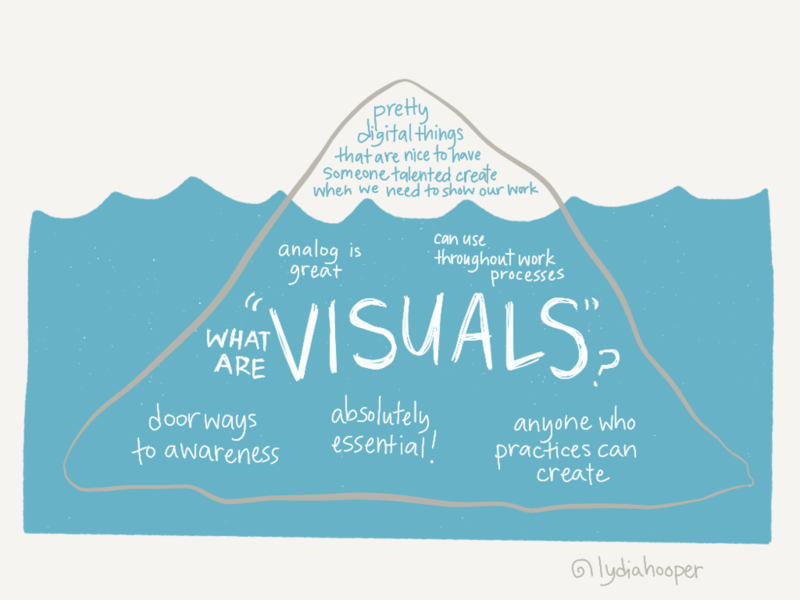 What is true about visuals is true about our creativity as well: even when we long to feel complete in our skills, take it from someone well-practiced, it’s always the case that we’ve only just begun. Practice is the thing. Opening that doorway again and again and again so we can wake up, and in turn aid others in waking up as well.